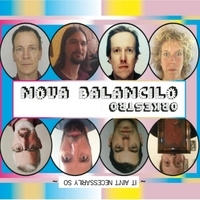 All musicians are real but the Nova Balancilo Orkestro exsists only virtual! Nova Balancilo Orkestro is founded by Duo Nora Mulder - Rogier Smal. They are an improv piano/drums duo and enlarged the duo with a virtual Orkestro. Ofcourse, all musicians are real, they play together in the Amsterdam music scene. But in this song they haven't heard each other before the record was made. Apart from Nora on Hammond Organ and piano, Rogier on drums and percussion, you can hear John Dikeman on alto sax, Yedo Gibson on tenor sax, Joost Buis and Koen Kaptijn on trombone, Han Buhrs vocals and Phil Wood speaking.